Quick Service Restaurants – Beating The Slowdown Trend | Business Article | MBA Skool-Study.Learn.Share. Even when slowdown is biting every sector of Indian market, QSRs or Quick Service Restaurants, specific type of restaurants that operate in the value-for-money segment, are growing at a rapid pace of 25 per cent to 30 per cent, and operating on minimum gross margins of 20 per cent. The article talks about some of the prominent challenges that these QSR’s face, but how the market is still attractive, and presents a plethora of opportunities for entrepreneurs, investors as well as consumers. TRENDS: WHAT’S IN THEIR FAVOR? Firstly, these QSR’s are mostly focused on single product, for example. Fasoo’s specializes in several types of Kathi Roll’s, Goli Vada Paav which has more than 125 outlets delivering delicious Vada Paav’s, and many more such examples. Another advantage they provide is high speed and consistent food service. They have supply chains running efficiently for speedy delivery of their products. Also, their supply chain can be expanded on need basis. They have fast turnaround time through efficient model of takeaways and quick order placement and delivery. This also turns out to be another big plus point for them in terms of modest real estate requirements : as for takeaways and delivery, real estate costs are about 10 to 12 per cent of sales – lower than 15 to 20 per cent of outlets that offer seating and ambience. Apart from tier I cities, they are targeting tier II and tier III cities too, and have opened up their outlets at convenient locations with easy accessibility from places. In metros, there are plenty of options available to consumers, however it is the next tier cities which have been so far deprived of multiple options and hence they are becoming the fastest growing markets for these companies. Customers also like these chains because of the specialized food they provide and being low in cost when compared to other restaurants in general. The interest shown in the QSR business is evident with the increasing number of investments in this space. Sequoia Capital India, recently invested $5 million (about 22 crore Rupees) in Faaso’s, a Mumbai-based chain set up in 2004, that serves wraps with a desi flavour, such as panner tikka and paneer reshmi. 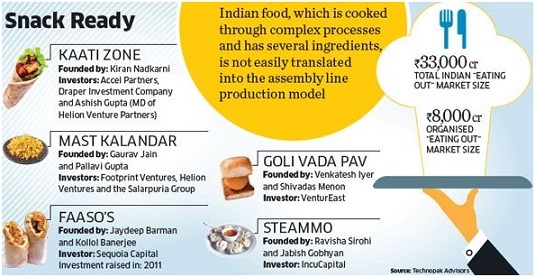 Venture capital and private equity fund VenturEast, invested Rs 21 crore in Goli Vada pav chain, which currently has more than 125 vada pav outlets across various cities in India. “In most retail models, including quick service, time and effort is needed to perfect the basic unit model” according to Kanwaljit Singh, senior managing director at Helion Venture Partners, who have invested in Mast Kalandar in 2010. Mast Kalandar, which serves vegetarian food is backed by venture capital fund houses such as Helion Ventures and footprint Ventures, is planning to roll out 65 outlets by the end of this year. Kaati Zone raised funding in 2007 from Accel Partners, Drapper Investment Company and Helion Venture Partner’s Managing Director Ashish Gupta. Given the fact that in India a typical sub-$5-million VC investment can go a long way in scaling up, investor community is showing more interest in these start-ups and the sentiments, in general, are that of excitement. While building a QSR brand in India, the most important thing is to offer something which is acceptable to various sections of Indian consumers, as different regions have different taste and cultural preferences. As once the brand picks up, the replication of the model across different places becomes easier. In the highly competitive and price-sensitive Indian market to target mass market, these chains have to keep their prices in affordable range (Rs 80 to Rs.100). Apart from these, supply chain management is the most essentially part of any food-chains. To ensure that back-end is efficient and appropriate for the business, owners need to be very cautious since supply chain is the backbone of their business. Hiring and retention of people: A start-up is after all about its people, therefore it is necessary to attract best of the people and most importantly to retain them. The employers need to assure their employees of opportunities for their growth within the organization. As majority of the staff comes under less-educated and lower salary category, there is a need for proper education and training of the staff. Sourcing ingredients, negotiate pricing and authenticity of ingredients: Due to lack of infrastructure, poor transportation facilities and erratic supply chain there is a huge wastage of food grain and other food products every year. As a result of such wastage, there is a need for careful selection of ingredients and getting best price for raw materials, so that increased cost of input food materials can be managed. High Real Estate Costs: For setting up food service outlet, selection of location can play a big role in the success. However due to lack of initial investment, a number of these outlets operate under lease premises and hence high real estate rental costs impact the growth and profit margins of the industry. Government Rules and Regulations: Taking licence from local government body bureaucrats is a painful task, there are numerous licences and insurances to be procured before setting up a food store. And getting them approved is not an easy task and may take up upto an year or even more. Organize Supply Chain: There are several requirements of food industry like cold storage facilities, logistics and warehousing, specialized distribution for perishable food items etc., and an inefficient supply chain can be a big hurdle in the success of these outlets. Franchiser has to work closely with the local business partners and suppliers, evaluating and reviewing key factors like inventory management, identifying distribution centres that can be made responsible for procurement. Hence sufficient investment as well as maintenance of supply chain is very essential for these business models. Raising venture capital: To sum up the above challenges, to small extent or large, there is a huge requirement of funding from venture capitals. Some of these QSR’s have been successful in managing the same, however there is a need of support from my venture capital firms. The organized food sector, which is approximately only 16-20 per cent of the total food industry will grow at a rapid pace considering the higher level of disposable income have led to a more rapid habit of eating out in many areas of India. According to a report by Technopak Analysis, the market size of the food services sector is estimated to be $8.1 billion by 2013, and $9.6 billion by 2018. It is growing at 5-6 per cent per annum. While uniqueness is the key to their success and capturing the market, sustainability in long run is what would decide the fate of this model of food chains. When big food chains like TGIF are restricted to only metros, most quick service restaurant chains have begun expanding their operations in the tier II and tier III markets of India. With sales estimated at $10billion to $13 billion, unorganized players account for approx 80 per cent of sales. No wonder why like everyone else, big brands like Milk producer Amul and Mukesh Ambani’s Reliance industries have set their eyes on fast food sector too, with Amul already having tested outlets in Ahmadabad. The market is already competitive and when even more players are eyeing to enter the market soon, maintaining profit margins is a prominent challenge which these QSR’s would have to pass, for being sustainable. To conclude, the demand for fast foods and organized food chains is rapidly rising in India. With higher levels of disposable income among consumers and changing dietary habits, the demand for fast food and organized food chains is going to be the trend even in the future. New start ups are seeding every day and are doing fairly good so far, given the large number of challenges they have to overcome. Attempts are being made by firms like Reliance, Amul and other big market players to develop food-chains. 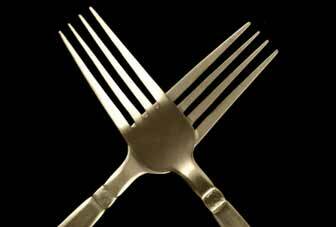 Pegged at $1.36 billion in 2011, Indian QSR industry is stated to grow at a CAGR of 35% to reach $4.5 billion by 2015. So, the future of QSR industry is bright, given the positive investor sentiments and enough room for establishing Quick Service Restaurants across various cities of India. This article has been authored by Nipun Bansal from IIM Ranchi.